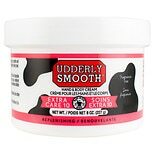 Shop Udderly Smooth Body & Udder Cream Lightly Scented (12 oz. )12 oz. Shop Udderly Smooth Hand Cream (4 oz. )4 oz. Shop Udderly Smooth Extra Care Cream Unscented (8 oz. )8 oz. $639$6 and 39 cents$0.80 / oz. Shop Udderly Smooth Foot Cream with Shea Butter (8 oz. )8 oz. $499$4 and 99 cents$0.62 / oz. $499$4 and 99 cents$0.31 / oz. Shop Udderly Smooth Udder Cream with Pump Dispenser Lightly Scented (10 oz. )10 oz. $499$4 and 99 cents$0.50 / oz.